It never fails. The day you want to start something, the enemy comes to distract you. Whether he succeeds or not really lies with you but in those moments, we feel that he has total power. 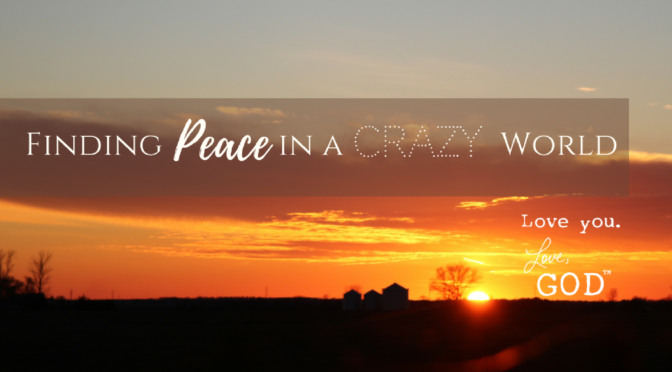 The title Finding Peace In A Crazy World is about slaying the demons that demand our attention and focus when it should be elsewhere. Let’s face it — we live in a crazy world where the unexplainable, unimaginable happens EVERY SINGLE DAY. What can we possibly do to get through the days when the crazy seems just a little over the top? Well I’m going to tell you but FIRST, I have to share a little bit about what I heard on the radio this morning. I had decided (after procrastinating the past few days) that today would be the day I wrote this blog entry. After doing a poll on social media on the title that people wanted to read most, it was clear that most people are looking for peace in this crazy world of ours. I started with my routine — got my coffee, warm compress for my dog (he has back issues), journal entry, bible reading, morning devotional and that’s where it stopped so that I could start writing. I had put on my headphones this morning so I could really concentrate and because I don’t pay for a streaming service, I have to listen to an occasional news story or commercial. One, in particular, stood out to me today. It was about a new class* offered at Yale University on finding happiness. Who would have ever thought that people would need to be taught how to be happy!?!? I’m not sure if there’s been a study done or not but I’d venture to say that our society as a whole has become increasingly unhappy for a number of reasons. Distractions take us away from the natural ways we once found to release stress and we find ourselves encapsulated within a virtual world where we can hide from just about everything. But at what point do people face reality again? In the 316 years of Yale University, this has quickly become the most popular class with nearly 1/4 of all undergraduates currently enrolled. The class, entitled Psychology and the Good Life, “tries to teach students to lead a happier, more satisfying life in two-weekly lectures.” With close to 1200 students, the 42-year old teacher [Laurie Santos] has quite the task ahead of her. Enrollment in a class like this at a school like Yale only reinforces my assumption that we aren’t happy. Students are asked to do things like sleep 8 hours each day and write 5 things they are grateful for, just as a start. I think it’s funny how the ideas I was going to share about how you can find peace in this crazy world are along the same lines as the principles Santos is teaching in her class. In 2006, Harvard offered a similar class with attendance around 900. The difference in the classes — this class incorporates behavorial change. Finding Peace In A Crazy World isn’t something you think about often. I mean the saying goes, if you can’t beat ’em, join ’em, right? I think we often get caught up in the crazy and assume we just have to stay there. What if I told you that you don’t have to? That amidst the daily struggles, you CAN find peace — BUT it won’t come easy. It will require some thought, action and quite possibly, behavioral change. You can be in the best mood, having a great day and then BAM! Someone poops in your Cheerios! Don’t like that analogy? You leave your wallet at home, you need gas and you’re already late. You have somewhere to be and all the forces of the world seem to be keeping you from getting there. It doesn’t matter whether you have prepared dinner in advance, packed the car ahead of time and stayed on track ALL DAY. Up until the last minute when the craziness began, you were going to be one time. What about the times when it isn’t about time at all? Maybe you set aside a day, or just a few hours, to yourself. You strategically planned a certain amount of time where you could do something that would help you recover from the daily grind or maybe you carved out just enough time to do nothing at all. No one is going to be home so it will be perfect, right? Then a threatening snow storm that we all know will end up being 1/2″ of wetness cancels the meeting your spouse was going to and events the kids were to be at this evening. Suddenly what was going to be your time has turned into a mad dash to the bath tub where you blow out the candles, let out the water and just get into bed. I mean, your relaxation is over now anyway — or is it? Here’s where we go wrong folks — we allow circumstances outside of our control, control us. We fall into the trap that the enemy has set to take the very thing that will help us get back on our feet. Our time to ourselves, that schedule we hold so dear, those things we’ve looked forward to. Instead of pushing through to make those things happen, we so easily cave into the feelings we took on in the middle of a stupid mishap of things that we have no control over. What if when those things happen we start to think of a 5-letter word that will help us keep our sanity and incidentally on the right path? You’ve got the music going, the day is going great and your mind, well it’s in a really good spot. Your heart is full because life is just spectacular or maybe you’re simply feeling an abundance of gratitude despite any minor complications. The news comes on and shows a situation that takes your attention. What is going on in this world. You turn to social media to see if you can find out more information or even better — what do your friends think about it? When you get there, you’re caught in the trap. Story after story, post after post, thought after thought. You’re caught and find yourself feeling differently than you did before. You start to take on the feelings of those you’re following and stories start affecting you that you would have never known about had it not been for the news. Let’s stay on the topic of social media for a second. It’s a great tool to connect and get information out, I won’t say otherwise. But for those who are so easily distracted, who take on the emotions of others, who tend to care a little too much what other people are doing, well it can be a trap that you almost can’t get out of. I talked to youth about this recently at a weekend retreat we went on. Whether you’re 16 or 36, people easily find themselves feeling discouraged when looking at social media for one simple reason — they’re not doing what everyone else is doing. It’s so easy to get caught up in wishing we were doing what someone else was doing, that we were invited somewhere that our friends went, that we had little baby or a new puppy, or that we were able to go on a vacation with our spouse. What happens when we get caught in someone else’s life is that we forget about our own. We fail to see the beautiful things going on in our own life and start wishing we were living someone else’s. It’s not intentional so if this is you, don’t feel bad. I can’t say that this personally describes me but on occasion, it can if I let it. We have to be careful with how much we believe about what we see. For the most part, people aren’t going to post a photo of the argument they got in right after they posted that perfect selfie on the beach. Nope. And they’re not going to show you the closet floor full of clothes that they had to try on for hours to look as good as they do in that new outfit they had to put on the credit card for that special occasion — that outfit that they couldn’t afford and will probably never wear again. That friend won’t tell you how much they cried before actually going out the door to that party or that they don’t really belong in that crowd of people — that they’re only going so they don’t have to be alone. That church friend who seems to know and be loved by everyone, they’re not going to share that they struggle every day to keep their focus, that they have to pray to pray and IT. IS. HARD. 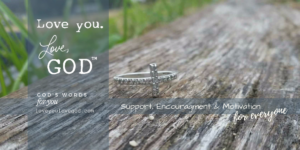 on most days to be an encourager. People aren’t going to put all of those things on social media, they’re going to put what looks best…what looks like they are living their best life. The problem with that is it isn’t life. THAT isn’t life. Life is full of good days, bad days, tragedies and triumphs. There is not one person in this world that has it all together. If they try to tell you they do, they’re probably one who has a messy closet they go cry in on a daily basis. Can I tell you something? You aren’t failing when you have a bad day. you aren’t failing when you have to fake your smile or fight past feelings causing you to struggle. You aren’t failing when you realize you really need to think about the reasons you should be happy. You’re just at a point when the crazy world is starting to get to you. *Read the full story here.